Santa Claus is in a hurry to hand out all the gifts and we will have to help him fulfill his mission. He does not have time to go everywhere with the sleigh, so he leaves it parked and will jump from roof to roof to let loose the gifts by the chimneys. You have to help Santa Claus to jump over the rooftops and to release all the gifts in the houses so that the children wake up with new toys. You must be careful with the obstacles and for this you have to use the PC mouse. Click on the left mouse button to jump and dodge the holes and obstacles that will appear on your way. Save the Christmas and leave gifts to all the neighbors of this city. 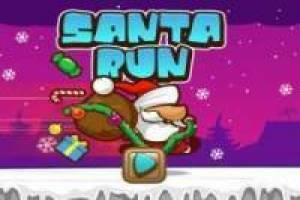 Enjoy the game Santa Run: Distributing Gifts, it's free, it's one of our Christmas games we've selected.